The concept of time varies greatly across cultures. In America time is a limited resource, “Time is money”, while a Chinese proverb states the opposite: “When God made time, he made plenty of it”. Can you see how this might lead to a business conflict? The strategy for our international business endeavors should be adapted based on the culture we deal with. We distinguish three time concepts: linear time, multi-active time and cyclic time. These cultures view time as a limited resource. Time is money. They believe that you become more successful if you get more work done. Because of this time is strictly controlled. They move forward as quickly as possible with an action and task-orientated mindset. Interruptions are not preferred and taking a phone calls during a meeting is considered rude. Punctuality, especially for the Swiss and Germans, is very important and lateness is not tolerated. They feel that the future is not entirely unforeseeable. After all, they work hard in the present on the tasks necessary to achieve their future goals. In business it is expected that a quick decision can be made. No decision is seen as a lack of progress and therefore a waste of time. South American cultures and countries bordering the Mediterranean have a multi-active view of time. They value personal interaction over schedules; they will ignore the passing of time if human interactions will be left unfinished. As a result, they don’t mind being flexible in their schedule. Imagine the confusion that can arise when a linear-orientated Swiss and a multi-active orientated Italian are working together. The Swiss, with the watch as a national symbol, will have a hard time understanding that the Italian is an hour late. The Italian, on the other hand, doesn’t see the problem: he was in an ongoing conversation. Multi-active orientated people prefer to do multiple things at the same time. They pretend to have a schedule, especially when a linear-orientated person is around, but the focus is on the present instead of the schedule. As you can see in the figure above they do not try to control time. They react to the events as they come during the day. In other words, they are less interested in following a schedule and only move forward when ready. Their focus is on feelings, relationships and people. Cyclic time cultures (most Asia and African countries), view time as plentiful. They don’t try to control time; they allow events to unfold naturally. Time is viewed as repetitive: each day the same routine happens, day in day out. This view also shows in their way of doing business. The decision making process in cyclical cultures can stretch over a long period of time, every option is considered. From their perspective there is no rush, time is plentiful. And since time goes around in a circle, the same opportunities will be presented again later, when they have more knowledge. 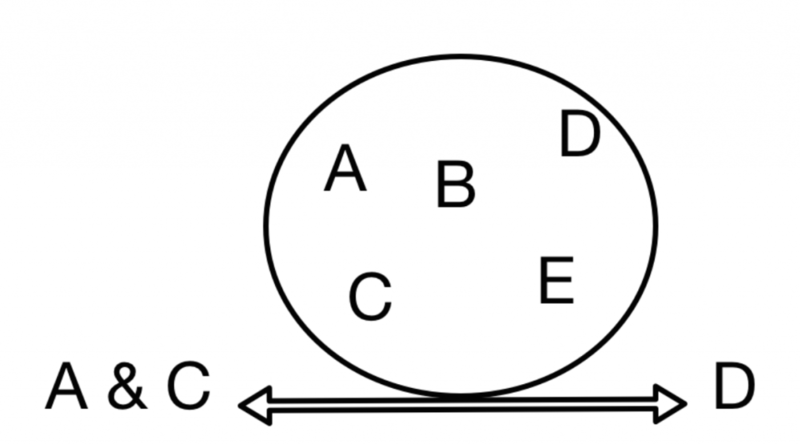 As you can see in the figure above every option is considered, they go around the decision in a circle. They might seem to go for option D, but after more consideration they might decide for a combination of A and C.
Imagine a linear-orientated American doing business with a cyclic-orientated African businessperson. After days of negotiating the American is expecting a decision. The African can’t do this without considering all the options and taking time. The American will see this waiting period as wasteful and expensive. The African will likely not understand this frustration, an African proverb: “A ripe melon falls by itself”. There might be confusion understanding China’s cyclical view of time. The Chinese are more punctual; they arrive on time and often thank people for their time. They don’t want to ‘steal’ anyone’s time. Because of this they also announce soon after the meeting has started that they will have to be going. However, they will not leave until the business is done. It is said out of politeness towards the other people’s time. This is not typical cyclical behavior. As a result, you might expect a quick decisions making process. But, the Chinese take their time and want to consider every option. As you can see, the concept of time varies greatly across cultures. Your cultural understanding will help you to achieve successful business relationships. Learn more about the concept of time in the video below and in the book When Cultures Collide by Richard Lewis.